Resolution 1: Tie up loose ends by completing divorce related paperwork. If you have been debating getting a divorce or dragging your heels in completing the paperwork required during the process, the Huffington Post advises using the new year as a springboard for settling old affairs. 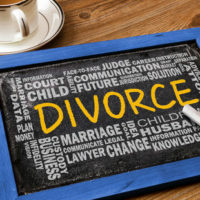 Unless you have realistic hopes for a reconciliation with your spouse, resolve to put this episode of your life behind you and take the steps needed to get your divorce finalized. Resolution 2: Get the best possible divorce settlement. Under the Florida Statutes, you are entitled to your fair share of any property and assets accumulated during your marriage. This includes real estate, cars, and home furnishings or personal belongings, as well as financial accounts and retirement benefits. Speak with your attorney about making an inventory of this property and let them know if you suspect your spouse is hiding assets. In some case, you may also be entitled to spousal support, which can help you begin your new life. Resolution 3: Make a budget and rebuild your credit. Divorce can have a major impact on your finances and learning to live on only your income can be an adjustment. Make a realistic budget regarding your living expenses and make every effort to stick with it. There are numerous online tools and community services that can help. Consider opening up a credit card in your name or taking out a small loan as well, which can help re-establish your individual credit. Resolution 4: Hold your non-paying spouse accountable for child support. Parents have an obligation to support their children. If your spouse is not currently paying child support, your divorce attorney can guide you in the actions needed to get an order in place. Once you have a child support order, if they continue not to pay they may be subject to serious penalties and actions such as liens and wage garnishment. Resolution 5: Take good care of yourself. One of the most important things to remember during a divorce is to take good care of yourself, both physically and mentally. Make a point of eating right, avoid overuse of alcohol or isolating yourself from family or friends, and talk to your doctor if anxiety, sleeplessness, or depression becomes an ongoing problem. At the law firm of attorney Vanessa L. Prieto, we understand how challenging going through a divorce can be and are here to provide the caring support and professional legal guidance you need throughout the process. To request a consultation to discuss your case, contact our Fort Lauderdale divorce attorney today.